I’ve already contacted Shadow and will being sending an amethyst pendant. I’m working on some hand decorated (by me) mini surfboards for promo giveaways. They’re really nice, if I do say so myself, and each one is a little different. I’ll post when I’ll have the giveaways so you’ll have a chance at the contests. Look for my posts sometime in May through early June. I’m participation in this years Christmas in July at Romance books “R” us. 2nd Annual Christmas in July TWO Contests! Dates: 1 July through midnight EST 31 July. We only ship snail mail items to US and Canadian addresses. 2. Visit http://romancebooksrus.blogspot.com. Click on each of the 20 Bloggers names left sidebar) to visit their sites. Find the name of one of their books along with the names of the hero and heroine. COLLECT THE 20 BLOGGER NAMES, BOOK NAMES, AND HERO AND HEROINE NAMES. (If a blogger has two pen names, only do one). In ONE email message, send all this information to: contests.rbrus@gmail.com NOTE: For April Ash books information, click on MY BOOKS at the top of the page. Prize: Amazon/Barnes & Noble $25 Gift Certificate. I must apologize for being soooo late with this. Congratulations, Dee! You are the winner of a mini surfboard. I will contact you in a little bit. 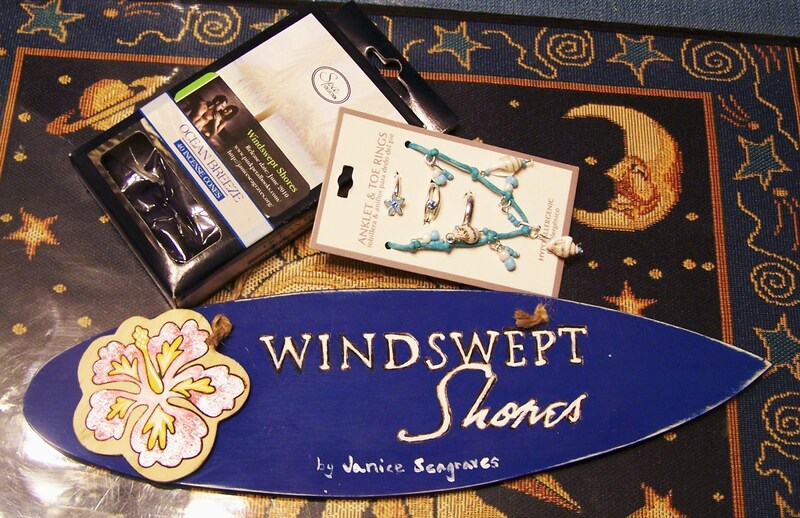 Dee has decided on the Windswept Surfboard, which I will be mailing to her on Monday. On my next contest the Abso-bloody-lutely surfboard will be up for grabs. Please check back for details on my next contest. The drawing for the contest to celebrate my book launch is today! Checking over my list and writing out the names. Twenty-four names went into my hubby’s Aussie hat. He isn’t an Aussie, he just has the hat. My nephew Bobby (hubby’s side) came by for a visit, so I enlisted his aide. Jane can you please get in touch with me, so I can get your prizes to you? or the one for Pink Petal books?